Glue Dots: Invisible Solutions. Visible Results. There are numerous occasions within the printing, finishing and fulfillment process where the precise application of an adhesive is required. Applications such as hot-melt or liquid adhesive have been utilized, however, they always left a lot to be desired. Enter: Glue Dots; an exact application of adhesive in a form certain to meet your needs. Glue Dots are pressure sensitive adhesives that form an instant bond. Quick and easy to use, they leave no mess, residue, or odor. 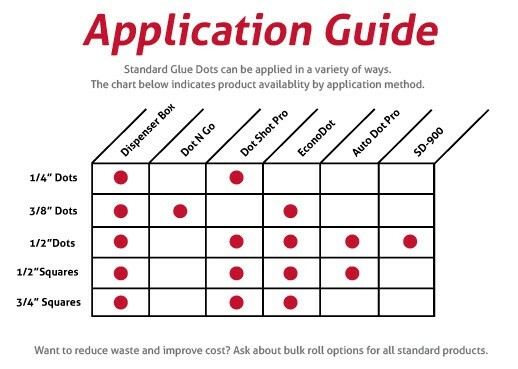 Glue Dots provide a low-cost and clean solution to adhesive application everywhere. They are suitable for jobs of all sizes, whether there are one-time or on-going requirements. Some of the most popular applications include packaging, printing, bindery/finishing, sample departments, mail/fulfillment and assembly, scrap booking and crafts, gift baskets and wrapping, greeting cards, balloon decorating, and much more. Use for clean tipping, applying coupons, promotional items, gift cards or samples. Most importantly, Glue Dots are clean and transparent so your finished piece stands our, not the adhesive. All Glue Dots are acid-free and lignin-free. Glue Dots "Profile" refers to the thickness of the Glue Dot. Low Profile Glue Dots are flat and commonly used for bonding level items. Medium Profile Glue Dots and High Profile Glue Dots are best suited for round or irregularly shaped objects or to create or bridge a gap, giving you the pop-out effect. The "tack level" refers to how sticky the adhesive is. Tack levels vary from "Low Tack," which is a removable bond, to Super High Tack, which creates a permanent bond on paper surfaces. There are a variety of sizes of GlueDots available. The standard size is 1/2", however, 1/4" and 3/4" are also available. In addition to the size, custom shapes such as rectangles, lines, and squares can be custom made-to-order. A wide variety of configurations are available to meet every industrial or consumer requirement. 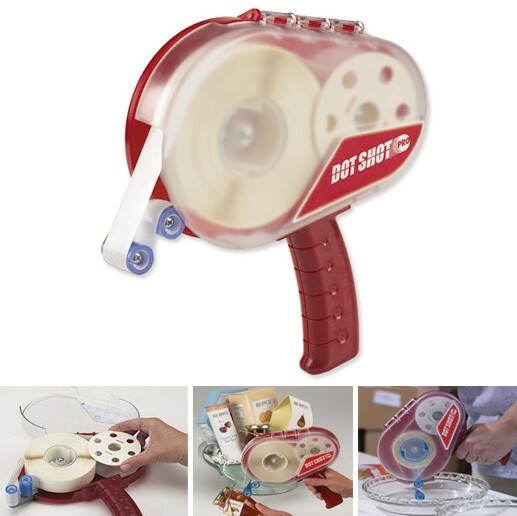 Glue Dots are available in compact sized rolls for a convenient-sized applicator "gun": The Dot Shot Pro. 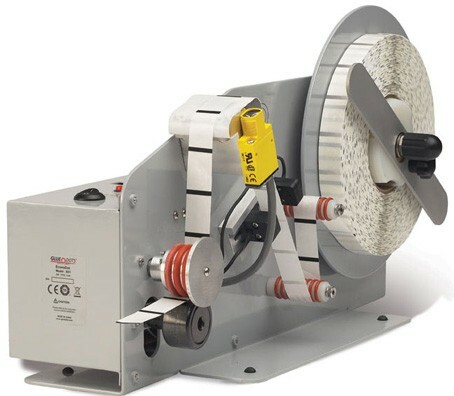 Larger rolls are available in the widest variety of offerings for both hand-held, and machine application. Consumer style Dot N' Go dispensers apply smaller dots for a variety of home, school, office and scrapbooking applications. The EconoDot is an affordable and easy-to-use electric adhesive applicator that greatly speeds up production. Special rolls of up to 8,000 dots are available so you can spend less time re-filling the machine, and more time preparing your products for sale or distribution. The EconoDot is lightweight and has a small footprint to provide convenience in portability. It runs on 120VAC.